The 11,000 tonnes of concentrate — 10 per cent more than the expected 10,000 tonnes and the maximum available shipping parcel — left the Port of Karumba in the Gulf of Carpentaria at the start of November on the cargo ship MV Wunma. The cargo was then transhipped to the export vessel Golden Daisy before making its way to its eventual destination, Huangpu New Port in South China’s Guangdong Province. 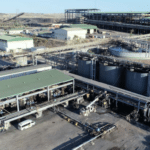 New Century commenced stockpiling at its 80,000 tonnes capacity storage shed in the Port of Karumba in September, marking the first use of the port facility since the Century mine was placed on care and maintenance by previous owners MMG in 2016. New Century is preparing for a second shipment of 10,000 tonnes in December. 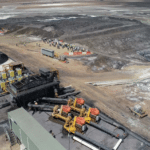 Stage one production at the Century mine is scheduled for 8 million tonnes a year (Mt/y) by the end of the first quarter of 2019, with a stage two ramp-up to 15Mt/y to follow by the end of 2019. Earlier this month, the company experienced some downtime delays; the first delay was due to an injury sustained by an employee of contractor Paragon Tailings, and the second delay was due to inclement weather that produced 11 per cent of the region’s average annual rainfall in just 24 hours.